Sandell, Lisa Ann. 2007. Song of the Sparrow. 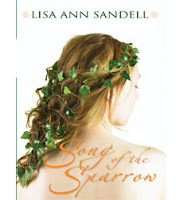 Song of the Sparrow is a wonderful verse novel that retells the story of Elaine the Lady of Shalott. While the literary tradition has her as beautiful but essentially weak and desperate, Sandell's Elaine is strong, brave, and while she, for a time, is lovesick on Lancelot, she is not too desperate or clingy. (Not, I'll die without his love desperate.) Meet Arthur, Elaine, Gwynivere, Lancelot, Tristan, and Gawain in this new telling of love and war. The poetry is powerful and quite effective in communicating the behind the scenes emotions as well as capturing the senses--especially the sights and sounds of battle camps and war. all is right and well. When we were all safe. I will be a woman soon.